Up to that point I had not paid much attention to this obscure instrument — often disparagingly referred to as ‘squeeze box’ — and I had not known much about it. I knew that it was the lead instrument in Argentine tango, supposedly very difficult to play. And it struck me as odd that bandoneon players would always sit down with a blanket on their knees. Now my curiosity was suddenly awakened, and I wondered what is the bandoneon all about? Where did it come from, and what makes it so powerful? And why has it become the signature voice of Argentine tango? Siri: “I found something on the web about ‘what is a bundle Nilen’. Check it out”. Siri: “Ok, I found this on the web for ‘looking for an instrument in Tango it’s called a band one on’”. This was not going anywhere. I quickly stopped this fruitless conversation and instead turned to real people, trying to obtain some more enlightening information. Disappointed, I found that hardly any of my friends outside tango knew what I was talking about, even the self-declared music experts. ‘You mean an accordion?’ was the closest reply I could get. So I went on to ask some people in tango, but to my astonishment I found that even most seasoned tango dancers weren’t very knowledgeable — or even interested. Puzzled by so much ignorance, I picked up the phone and called some direct sources. “Did you know that apparently there are only a few people in the world who know about the bandoneon?” I asked Héctor Del Curto, one of today’s most prominent bandoneon players, nonplussed. “Fewer than you think!” he laughed. His answer surprised me. Since his bandoneon workshops have a large number of attendees, both participants and listeners, I was expecting him to contradict my conclusion. As a matter of fact, his week-long high-level workshops at the Stowe festival have been so popular that candidates must pass an audition. And the number of prospective candidates applying for a spot keeps growing. On a regular basis even women — still quite a novelty in the traditionally male-dominated tango orchestra — and bandoneonists from as far away as Korea and Japan have become regular participants of these classes, drawing special attention with their outstanding playing. Hector Del Curto in action: He’s one of today’s most prominent bandoneonists. Still, judging by my own experience, the bandoneon remains by and large an unknown instrument. I suspect that there are two reasons for this. Firstly, despite its growing popularity worldwide over the past twenty years, Argentine tango, together with its lead instrument, still represents a marginal phenomenon. And secondly, no other music genre with a broader audience has made use of the bandoneon. This used to be different during its early days in the 19th century when the bandoneon was widely used for religious and popular music. It started with a clever German by the name of Heinrich Band, a music teacher from the little town of Krefeld, who pursued the idea of a portable and more affordable organ for small churches and chapels. Band worked on developing an extended version of the ‘German concertina’, a free-reed instrument which in turn had evolved from the accordion with bellows and buttons on both ends. He made significant changes to the concertina by extending its keyboard system from 54 to 64 then to 88 tones with 23 keys on the right and 21 on the left. In 1846 Band came out with a 100-tone version of his new instrument and started to sell it in his own shop. He named it after himself: ‘Bandonion’. Heinrich Band had intended his small portable organ for religious music, but folk musicians soon found its portability and affordability very beneficial for their own purposes, mainly in local dances and other social events. 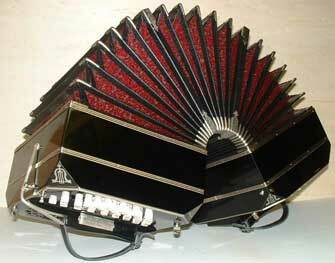 Thus the bandoneon became a favorite instrument of the then popular music in Germany. Around the same time, a German emigration wave hit its peak, and it didn’t take long before the bandoneon made its way to the United States, and from there to Uruguay and Argentina. Here it became a favorite with the immigrants, especially in the harbor bars and bordellos of Buenos Aires, where it eventually became the voice of a new form of popular music known as ‘tango’. 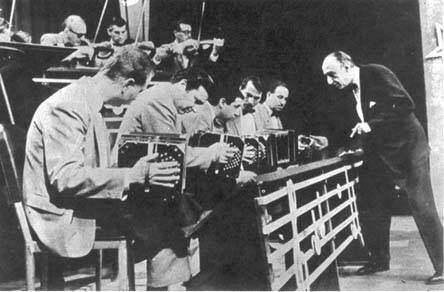 In the 20th century the bandoneon would conquer the tango world completely with players like Eduardo Arolas (‘el tigre de bandoneon’), Vicente Greco, Ciriaco Ortiz, Pedro Laurenz, Pedro Maffia and Aníbal Troilo as its leading proponents. They would later be superseded by one bandoneonist whose fame would reach far beyond the tango world by showcasing the bandoneon in ways nobody had imagined before: the great Astor Piazzola. That’s how a classic Orquesta Típica would look like. 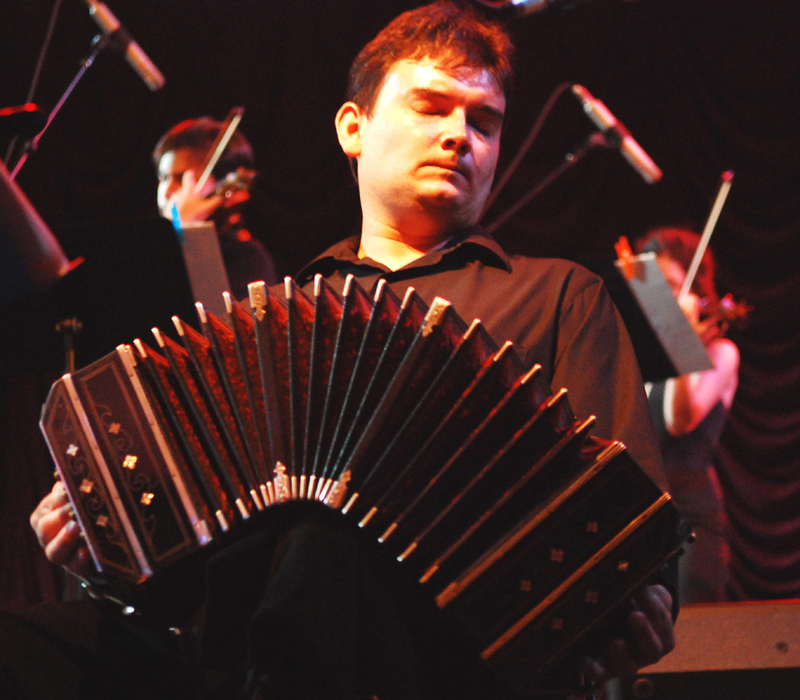 Celebrated Juan D’Arienzo’s orchestra played with five bandoneonists. But why is it that the bandoneon and not the accordion became the voice of Argentine tango? I put this question to bandoneonist Alex Roitman, who himself started out as an accordion player, but who switched to the bandoneon when he discovered Argentine tango. The founder of San Francisco’s well-respected tango quartet Tangonero, he has also become an enthusiastic student of Héctor Del Curto. Most recently he has also participated in the Stowe festival’s highly selective bandoneon contest, where he placed among the top three. Then there are the different mechanics. “With an accordion,” Alex continues, “you can’t really do a ‘marcato’ in the way the bandoneon can. It will never sound like the tango articulation is supposed to sound”. [Ed: Marcato is the marking of the rhythm, the chords that fall on every beat.] Because of the bandoneon size one can play marcato so that it is piercing through the melody without overbearing it. Tangonero’s Alex Roitman. 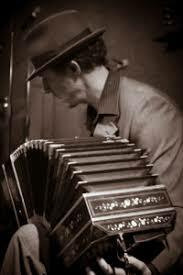 He played the accordion and switched to the bandoneon when he discovered Argentine tango. That metallic sound, together with what founder, composer, arranger, lead singer, and now bandoneonist of Berkeley’s Orquesta Z Bendrew Jong vividly calls the ‘whoosh’ sound (a player’s technique of pushing the knees together and thereby releasing the air quickly and forcefully from the bellows) is what produces the unmistakable and unique sound of Argentine tango. “It’s exactly that imperfection of the old-style bandoneon,” says Ben emphatically, “that makes tango sound authentic.” He calls it an effect that can’t be produced by modern instruments. I’ve heard the same passionate explanation from Alex Roitman and Héctor Del Curto as to why an old instrument is preferable to a new one. Most sought-after bandoneons, such as the Premiere or the AA, date from as far back as the 1930s. Bandoneon players are willing to go at any lengths to chase down an original AA from the first part of the 20th century when they were in huge demand in South America. Until 1948 the small family-run business of Alfred Arnold (maker of the AA) alone shipped around 30,000 of its handmade bandoneons to Argentina and Uruguay. The factory, in the tiny town of Carlsfeld, in the former Eastern Germany, was expropriated in 1948 and ceased to exist. Attempts to continue the tradition with newer materials and techniques at a new location in what was at the time West Germany didn’t produce the same results. Today there are about a half dozen bandoneon makers, three in Germany and two in Japan, and one in Belgium, but true tango bandoneonists claim that the sound of these new instruments is ‘too clean’ and ‘too perfect’ to their ear, possibly because of the use of electronic tuning. Bendrew Jong surrounded by members of his Orquesta Z. He picked up the bandoneon out of necessity. With more and more younger musicians becoming interested in the instrument, the demand for new and easier-to-maintain bandoneons may well grow in the future. But what is the reason for the increasing number of bandoneon players over the last ten to fifteen years? Héctor Del Curto suspects one reason is the phenomenal success of the show Forever Tango, which has led to the spread of the dance all over the world, and with it an increasing interest in the music and finally also in the bandoneon. “When I started playing,” says Héctor, “there were about ten serious players.”Today’s tango orchestras in Argentina can now choose from a much larger pool of mainly younger bandoneonists.” Hugo Satorre, bandoneonist of the successful Orquesta Victoria, recently told me that when he started to play less than 15 years ago he was one of only a few, and was consequently highly in demand. Now he has to compete for gigs with younger musicians. But while that might be true in Buenos Aires — the cradle of tango — it doesn’t necessarily apply in other parts of the world. Indeed, when Bendrew Jong’s bandoneon player suddenly died in a car accident no replacement could be found and he had to learn to play the bandoneon himself. It will be fascinating to see how interest in the bandoneon continues to expand. And indeed, in Germany, its original home, there is now a museum dedicated to the bandoneon: Das Tango- & Bandoneonmuseum in Staufen (https://staufentango.de/tango-bandoneon-museum/). Maybe in the not too distant future I might even be able to have a more productive conversation about the bandoneon with Siri. Many thanks to Alex Roitman, Héctor Del Curto, and Bendrew Jong for sharing their knowledge in long conversations with me, not all of which could make it into this article. I’m most grateful for their patience and support in making this article possible. 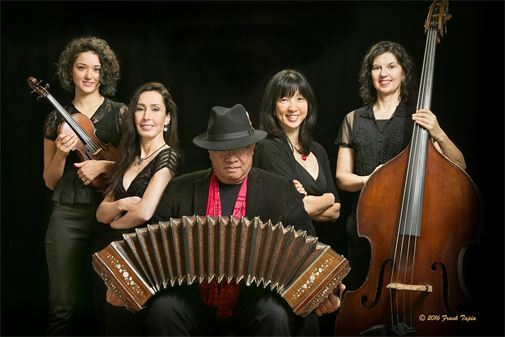 Photos: Bandoneon by Harry Geuns, http://bandoneon-maker.com/harry-geuns-bandonions-professional-model/; Héctor Del Curto photographed by Eduardo Milieris; Juan D’Arienzo and his orchestra (photographer unknown); Alex Roitman, photo thanks to Tangonero; Bendrew Jong and Orquesta Z photographed by Frank Tapia. Very interesting, Andrea. It was the sound of the bandoneon which first piqued my interest in tango music. Thank you, Amy! And thanks for sharing it on your Facebook page! Hope it’ll find more readers! Thanks, Radoslav! Yes, please share! Great article, Andrea. You answered things I have often wondered about.